Ducati Press Releases Information from the Factory and Ducati UK. ALL text and photo's published here by the webteam is copyright of Ducati and cannot be used without their express permission. Álvaro Bautista and Chaz Davies, the two Aruba.it Racing – Ducati team riders, have concluded two days of winter testing at the Autódromo Internacional do Algarve circuit in Portimão. After last weeks’ test at Jerez, this one in Portugal gave a further opportunity to the team, engineers and riders to gather as much data as possible for the development of the brand-new Panigale V4 R, the four-cylinder machine that this year will be making its track debut in the Superbike World Championship. As it is a totally new project, the riders were not on a quest for outright performance, but instead they concentrated on putting together information to allow the engineers to analyse all the work carried out so far. By working on all sectors of chassis, electronics and engine – as befits a new project – at Portimão the team positively concluded this important stage of the season, before departing for the official test and the opening round of the season at Phillip Island in Australia in two weeks’ time. 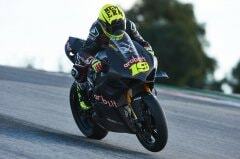 The next appointment for Aruba.it Racing - Ducati will be the official team presentation on Monday 4th February at the Aruba Global Cloud Data Centre in Ponte San Pietro near Bergamo. If you experience any problems or have suggestions on improvements whilst visiting our website, please contact the Webteam by Personal Message or by emailing us. Powered by vBulletin 3.5.4 - Copyright © 2000 - 2019, Jelsoft Enterprises Ltd. - © Ducati Sporting Club - All times are GMT +1. The time now is 03:34 AM.